Hollys Lodge is a two bedroom detached timber lodge, which sleeps up to 4 people and is located in the village of Brough, near Kirkby Stephen in Cumbria. The village sits in the lovely Eden Valley, between Appleby and Kirkby Stephen at the foot of the Cumbrian Pennines. Tastefully furnished, very comfortable and well equipped, it enjoys countryside views and a totally separate and very peaceful setting on a no through lane within a small, rural caravan park. 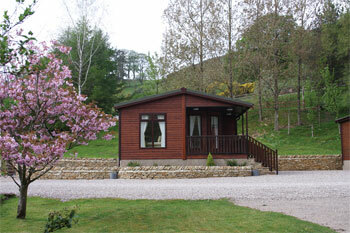 This is a wonderful base for those who enjoy outdoor pursuits – just a mile away, good roads give access to the myriad attractions and stunning landscapes of the Lake District National Park, Yorkshire Dales and County Durham, and the shops, pubs and restaurants of Brough are also only 1 mile. Two bedrooms. 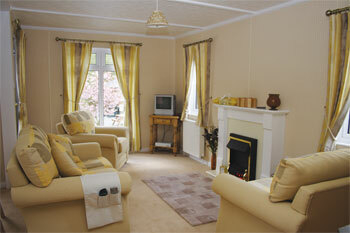 Entrance to newly furnished open plan sitting room with modern electric fire, dining area and well equipped kitchen. Double bedroom with ensuite shower room/W.C. Twin bedded room. Bathroom/W.C.